Not quite Engine Tech, did anyone ever found good results with a change in interior noise-levels by changing exhaust hangers to a softer material or different/modern design? I'm running a full 2.5" dual system in a '73 Dart with an X-pipe, Borla ProST (street) mufflers and tailpipes. 360ci engine w/11.3:1 cr, very mild street cam. I'm OK with the sound of the exhaust on the outside but the interior noise level at around 2k rpm when accelerating is just too much, so I like to dampen the noise coming into the cabin. Already installed self-adhesive heavy rubber antidrone sheets under the rear seat and floorboards, fabbed a stock-style cardboard w/soft dense foambarrier to block trunk-noise but this didn't appear to help much, if any. Currently using these just right after the mufflers and are connected to the reinforced area where the seatbelt-bolts normally would reside. Thinking of using a different type of hanger with a softer/larger rubber in between, and also mount it on the frame rails instead of floorboard, which I think would be the culprit. You may want to look at what modern luxury cars use. The OEMs spend a lot of time on NVH issues. Maybe Calvin aka "exhausted" has a suggestion? 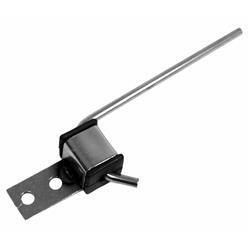 A flexible type exhaust hanger should be used in all automotive applications, mainly to isolate exhaust system vibrations. I don't think that exhaust hangers have much affect on interior noise levels though. Covering the interior floorboards with at least a quality 80mil thickness sound deadener may be your best option to quell the interior resonances, many choices/options available. As said earlier the flexi sections make a huge difference. 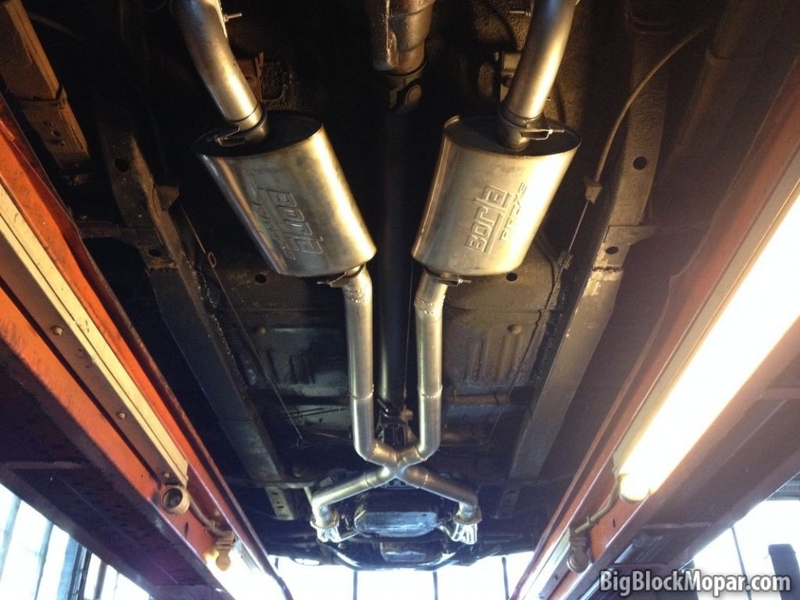 Also another trick is if possible in your space is move one or bothe mufflers , one a little forward and one a little back, this alters the resonant length from each collector to dampening area in the muffler, it does not change the note out the back much but can make quite a difference to cabin noise. 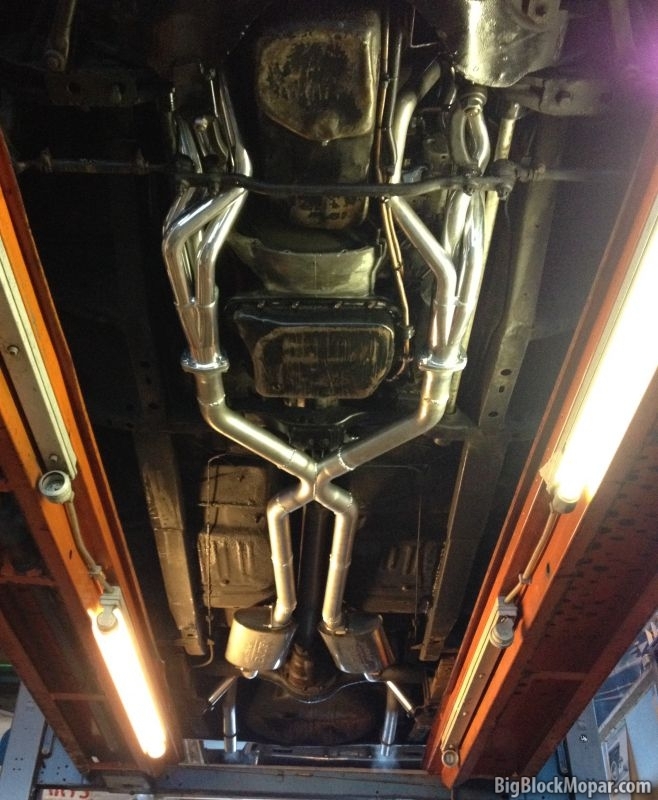 A friend removed headers from his car & fitted factory exh manifolds. Rest of the system was unchanged.... Droned with manifolds, didn't with headers. On one of my cars, I had the pipes [ 2" ] exiting ] through the rear bumper. Pipe was surrounded with silicon so there was no metal to metal contact between pipes & bumper. Removed the pipes going through the bumper & put turn downs on, so only last 12-14" of exh pipes was changed. Hangars used to support the turn downs. Through the bumper: no drone. With turn downs: drone. You can have seemingly identical bodies, engine parts & exh systems & some will drone, some will not. Even axle ratio [ load ] make a difference. You will have to experiment. My rather limited experience has demonstrated that pipe layout has great potential to introduce resonance into a car's cabin. I'd go with pcnsd's advice on correcting the resonance with piping. Right on target. Hanger compliance, location(as mentioned above) and exhaust design/routing can make a HUGE difference inside the cabin. Aside from doing my own mandrel bent designs, have been doing odds and ends exhaust jobs for years and the right OEM style hangers can completely eliminate drone on many mufflers that people have associated with causing drone. The luxury cars have some of the best designs, very bulky and heavy, but they work. I know this to be fact having fixed the issues many times and while also received many "free mufflers" that were needlessly blamed for the drone issues. Have to also be considerate of tip length as well since reverberation tendencies tend to go up, especially in the rear under that big speaker we call a trunk, as pipes get shorter and more tucked in. Don't need to stick out like flamethrowers, even just another 1-2" makes a slight difference sometimes. If fact, you can use the next pipe size up slid over your exits to adjust tip length and hear slight differences inside rrthe cabin at idle/high idle and cruise speeds. Sit in the car with the engine rev'd to around 2,000-3,000 rpm and have someone take the extensions on and off. Many are surprised at the amount of soundwaves that get reflected back under the rear of the car or truck. The car has a full exhaust up to the rear bumper. Except for 2 'welded' bends, all bents are mandrel bent. In my first post I said Borla-ST, but ment to say Borla-XS earlier. Thanks for those calculations Paul. I hope to be able to 'fix' this without having to resort to Helmholtz-resonators and add more weight in the process, but will go this route if the simpler stuff doesn't work. Instead of the floorboards I will fab new brackets to the frame rails first and use rubber O-ring donuts instead to further seperate the exhaust from the car. The previous exhaust on the car had 2 different muffler lengths at one point. No droning. But this was with a smaller, and low CR (8.6:1) engine in front of it. Also think a lot of noise comes from the rear axle area and trunk. I also placed a few anti-drone plates (2.2mm/86 mil) in the trunk towards the rear axle tunnel on flat areas that sounded most noisy by just tapping on them with a finger. I also fixed a length of angled aluminium on the outside of this board to limit flexing. In the 2nd pic one can see the hangers mounted to the floorboards. What's not shown is the hanger rod extends 'upward' in the photo and connects a little further down the exhaust to the tube (so not at the clamp at the muffler). I also tend to believe the droning has become more pronounced over time, as if the mufflers have changed in sound, as they were rather quiet at first when new. Exhaust material too, SS can ring, I believe. I have all the tricks mentioned above and the car still drones especially at higher engine speeds (+3000). I have been thinking that the X which is located right under the rear axle has to do something with that + the fact it has a fiberglass body. 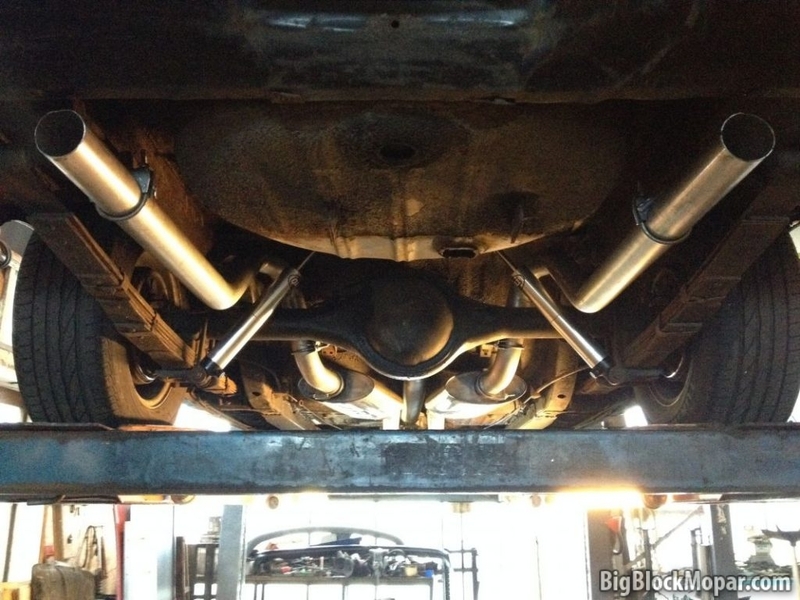 Do you also have staggered muffler to collector lengths? This is straigh up one of the most successful dual exhaust anti drone tricks, i have done this to some really terrible droning systems and only staggering the mufflers has made it completely drone free. That's pretty interesting. What happens if you have an h-pipe at a Pipemax length recommendation? Does it take enough "anti-drone length stagger" to screw that up enough to notice?